For courses in Correctional Administration. 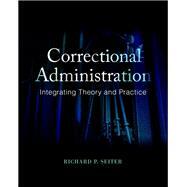 A practical introduction to the theory, practice, and challenges of correctional administration. Correctional Administration: Integrating Theory and Practice provides students a practical understanding of correctional operations. Touching briefly on the history and background of corrections, its focus lies in teaching students the purpose and practice of working in a corrections facility, along with the challenges that face its staff and administrators. Case studies, career information, and real situational examples give students a practical understanding they can take with them to a future career. The Third Edition provides students with updated information on the various elements and challenges of the job. Recent data regarding correctional populations and costs and research findings that impact correctional policy give students valid insight into how the correctional system functions.